Dollar Thrifty investors holding about 13.8 million shares voted against the $1.44 billion Hertz bid at a special meeting in Chicago Thursday, versus 11.8 million shares in favor. (Bloomberg) -- Hertz Global Holdings Inc. ended its attempt to acquire Dollar Thrifty Automotive Group Inc. after shareholders rejected the deal, clearing the way for Avis Budget Group Inc.'s $1.53 billion takeover offer. Dollar Thrifty investors holding about 13.8 million shares voted against the $1.44 billion Hertz bid at a special meeting in Chicago Thursday, versus 11.8 million shares in favor. Hertz CEO Mark Frissora said in a statement that the company would cease all activities related to the Dollar Thrifty takeover and work to expand its Advantage brand and U.S. off-airport business. Hertz's exit clears the way for Avis, which two days ago sweetened its offer with a $20 million breakup fee that Dollar Thrifty for weeks had asked it to add in case the proposal doesn't win regulatory approval. 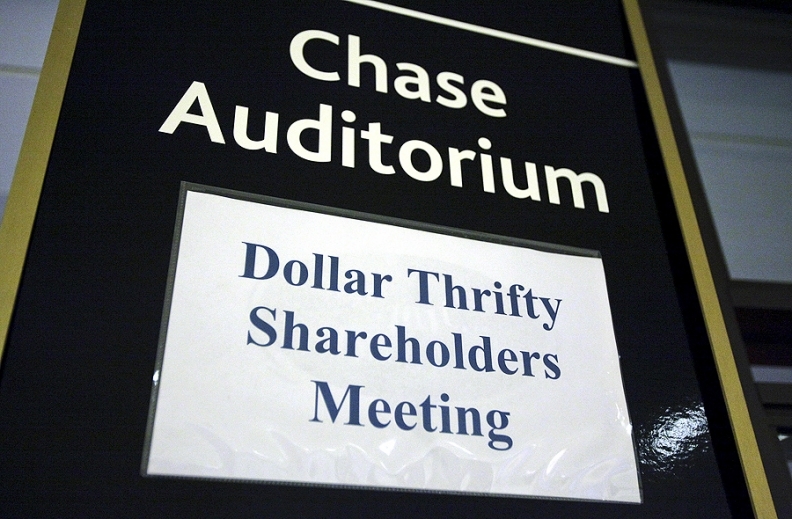 Dollar Thrifty's board had cited the lack of such a fee in rejecting the offer. Thompson's statement didn't mention Avis by name. Avis said yesterday in a statement that it will commence an exchange offer for Dollar Thrifty on its most recent terms within 10 days. Avis's bid, valued at $53.41 a share at yesterday's closing prices, represents a 51 percent premium to the average price of Dollar Thrifty's shares in the 20 days before Hertz's first offer. The average premium in acquisitions of auto- or equipment-rental businesses since 2005 was 17 percent. Dollar Thrifty has gained 29 percent since the day before Hertz's offer of $41 a share in cash and stock was announced in April. The shares traded for less than $1 as recently as March 2009. Hertz and Avis have fought over Tulsa, Oklahoma-based Dollar Thrifty for about five months, in part because of the consolidation of the U.S. market. The four largest U.S. rental-car companies account for 81 percent of the industry's revenue, according to IBISWorld. Hertz is the largest worldwide airport car-rental brand, operating from more than 8,200 locations in 146 countries. Ford Motor Co. in December 2005 sold Hertz to Clayton Dubilier & Rice Inc., the Carlyle Group and Merrill Lynch's buyout unit. The car-rental company raised $1.32 billion in an initial share sale less than a year later.